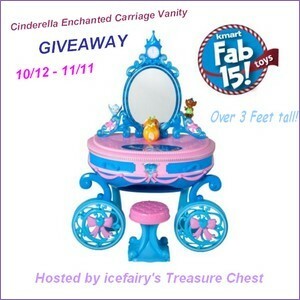 Welcome to the Cinderella Enchanted Carriage Vanity Giveaway! What a great prize to win right before Christmas! I know I have about three girls who would love to win this one. Do you plan to surprise your little one this Christmas with a cool new toy? Check out the Kmart Fab 15 Toy List to find out what's hot on the market this holiday season! Plus, rank the toys on the list and enter the sweepstakes to win your favorite one! One toy is being given away each day until November 22. Be sure to visit daily for a new chance to win! Better yet, you could win this gorgeous Cinderella Enchanted Carriage Vanity right here! As one of the top rated toys on the Fab 15 list, it has a retail value of $99.99! This Enchanted Carriage Vanity will help you arrive in style! Cinderella icon activated color change light feature around the mirror! One lucky winner will receive their very own Cinderella Enchanted Carriage Vanity! The giveaway is open to US residents 18+ only. It will run from 10/12 to 11/11, so you will have plenty of time to complete as many entries as you like, including daily ones. Please wait for the Rafflecopter form to load and enter for your chance to win. Disclosure: I received no compensation for this publication. Health, Beauty, Children and Family is not responsible for sponsor prize delivery. Please contact the host directly if you have any questions or concerns about this giveaway. Be sure to read terms and conditions at the bottom of the Rafflecopter widget. My favorites are the Dora Talkin Kitchen, ELMO Rock Live, and Furby. I like the Master Moves Mickey the best. Master Moves Mickey gets my vote for the best of Kmart's Top Ten List.